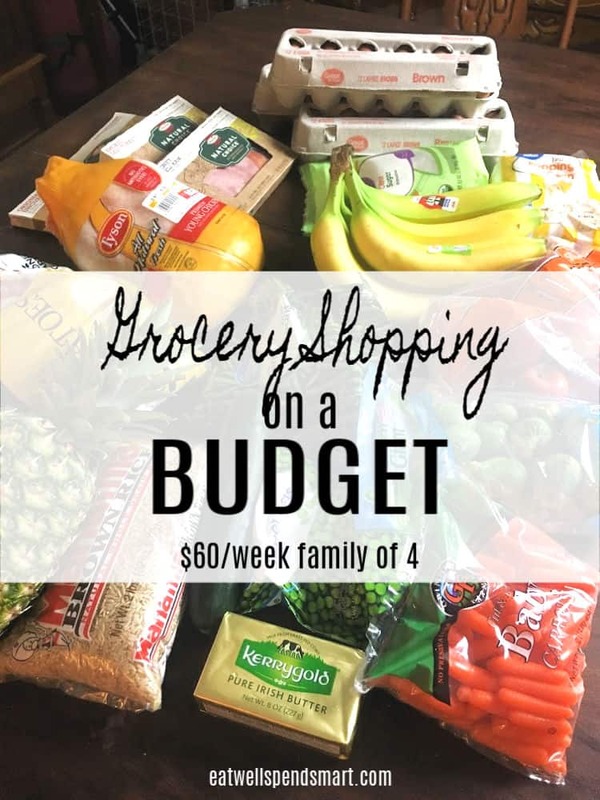 Grocery shopping on a budget for a family of four with a $60 weekly budget. 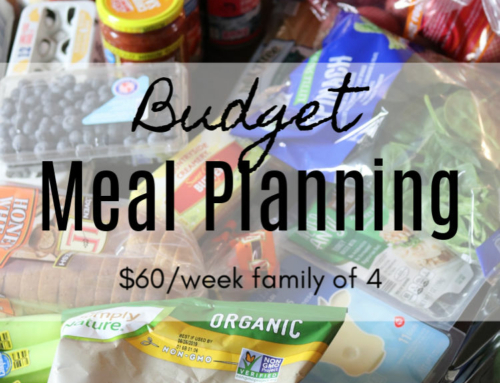 See an example of what we bought, spent, and ate for a week on a limited budget. 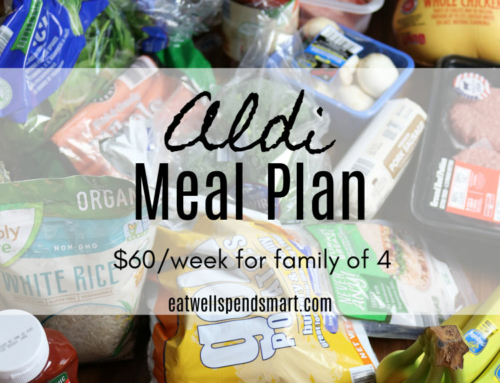 I can’t believe this month and our $60/week grocery budget challenge has come to an end. It has been fun but challenging for sure since this is about $40 less than what I typically spend in a week. I keep thinking I will have a perfect week where we eat at home every night and there are no special circumstances like company or hosting, but as I have reflected, this has actually been a pretty typical month. Every week we have something that comes up. We host company or people invite us out or over to their homes almost every single week. This is just life for us and why we have a separate budget for eating out. 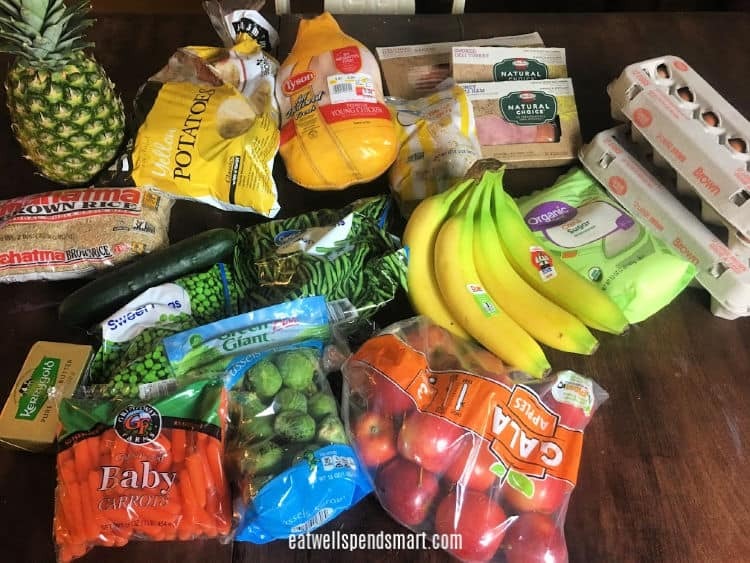 This week I shopped at Walmart since so many of you said you didn’t have an Aldi. I have answered the masses. Walmart it is. I admit it was more difficult and I wasn’t able to buy quite as much, but I still followed my principles. Take a calculator to the store and tally as you go. Buy meat that stretches for multiple meals. Shop your fridge, pantry, and freezer first and use what you have. Incorporate eggs (cheap protein source). 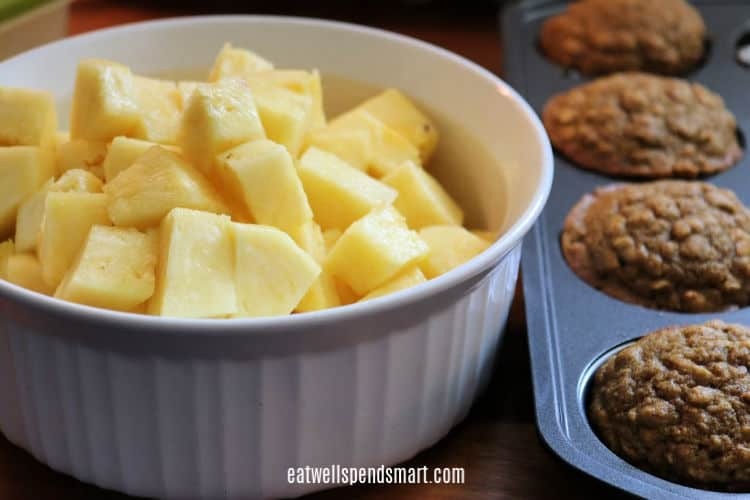 Buy inexpensive fruit that lasts all week (bananas, apples, pineapple). 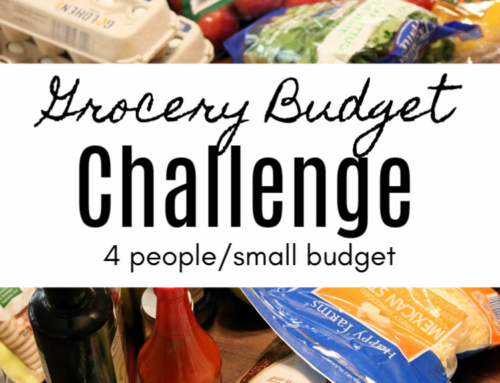 Focus on inexpensive sale produce and frozen veggies. Choose versatile items that you can use for more than one meal. Don’t be afraid to adjust your plan at the store when you see prices. It’s more of what you don’t buy than what you do. I had planned to buy a beef roast this week, but my plans changed when I got to the store and saw that it would not fit into my budget. I decided to stretch just a whole chicken and use my deli meat and eggs for another meal instead. Thinking on the fly is sometimes necessary when grocery shopping on a budget. This is what I ended up buying and spending. Add $18 for snacks that I bought on Friday. See Friday for details. 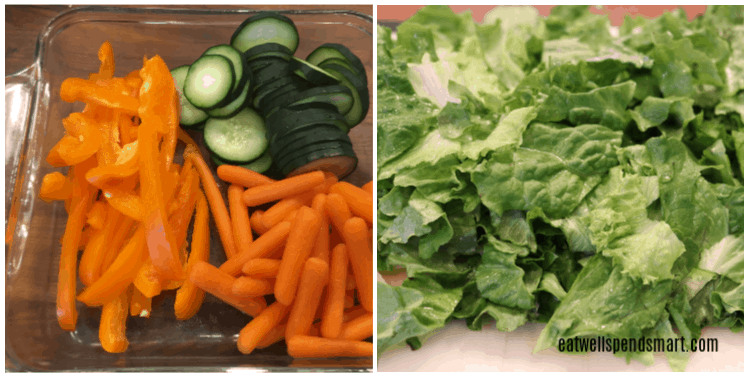 I prepped these foods to be ready for snacks, lunches, and quick sides. I don’t plan my breakfasts. We simply have a few options and eat what sounds good. A time saving tip that I use is to make a big batch of pancakes, muffins, etc and reheat throughout the week. Eggs take minutes to make so they are super easy to serve alongside. I don’t plan lunches either. I simply have a variety of options for us to choose from. Prepping cut up veggies and fruit helps to simplify. I had a head of lettuce that wasn’t eaten last week, so I made sure to eat a salad for lunch every day for the first half of the week before it went bad. I washed and chopped it so it was ready to go, which is what I should have done last week. For me, if it’s prepped I’ll eat it. If it’s not prepped, it dies a slow death in my fridge. The first day I topped it with leftover chicken tenders from the weekend. The second day I topped it with a bit of leftover chicken from my leftover IP chicken along with a hard boiled egg, apples, carrots. The third day I made a buffalo chicken salad with chicken and hot sauce, homemade ranch, carrots, and pumpkin seeds. My husband took lunch meat sandwiches, prepped veggies, pickles, and apples and peanut butter to work with him M-Th. On Friday I made a quick “lasagna” for lunch for the two of us. It was boiled lasagna noodles that I had cooked too many of on Wednesday night. I mixed it with a jar of marinara and one chopped up leftover burger. Then I topped it with the last 1 1/2 slices of swiss cheese and popped the skillet in the oven for about 15 minutes to heat through. Lunch was out with my husband’s family after church and my in-laws graciously paid for everyone’s meal. Dinner was leftovers/fend for yourself. 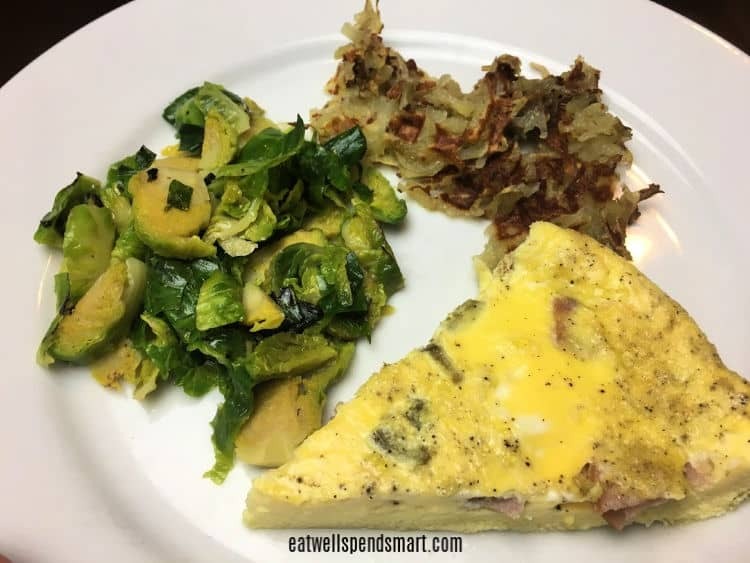 Ham and jalepeno egg bake, Brussels sprouts, and waffle iron hashbrowns. My kids loved this. I used a few slices of the deli ham and chopped it up along with a few jalepenos. Then I mixed it with eight eggs, water, salt, and pepper. I baked it in a pie pan at 350 for about 25 minutes until puffed. The Brussels I sliced and sautéd on the stovetop, and the hashbrowns were cooked in the waffle iron. I do not recommend this method the way that I did it. While I still think it’s a great idea, I need to perfect the technique. Instant Pot whole chicken, gravy, baked potatoes, sautéd frozen green beans. I prefer my whole chicken cooked in the oven, but the Instant Pot won for time purposes on this particular night. Potatoes were cooked in the microwave and green beans on the stove. I made a quick gravy with the chicken drippings and the last of my rice flour. I used 1/3 of the chicken for dinner, 1/3 of the chicken for lunches, and 1/3 of the chicken for Wednesday’s dinner. The chicken bones were cooked with water in my slow cooker all night for broth. I was too lazy to even season or put veggies in it so it was just bones and water. 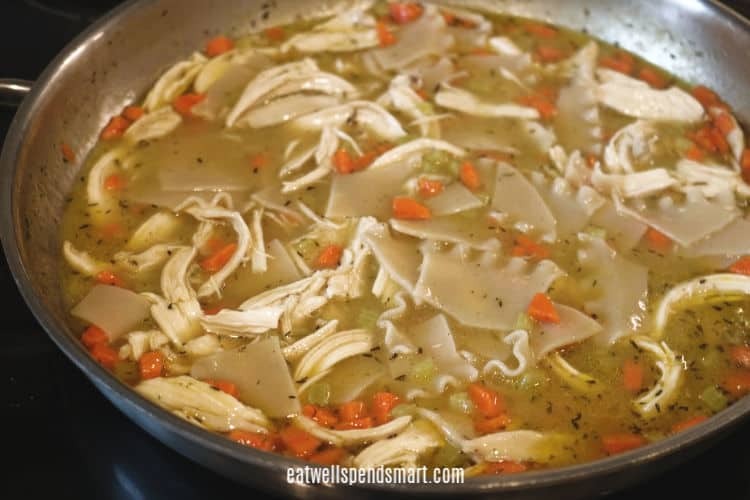 I had planned to make chicken noodle soup, but wasn’t feeling it so I made something up on the fly. This was surprisingly very tasty and was similar to a cross between chicken and dumplings and chicken noodle soup. My son had two helpings. I had a random box of lasagna noodles that I broke up and used for this dish. First I sautéd carrots and celery. Then I added broth that I made in the slow cooker, leftover gravy, thyme, salt, and pepper, and broken lasagna noodles. When the noodles were tender, I made a slurry with cornstarch and water to thicken the sauce. Lastly I added 1 1/2 c. of chicken reserved from Monday night. So yummy! It had been a long week already and I needed a no-brainer dinner. 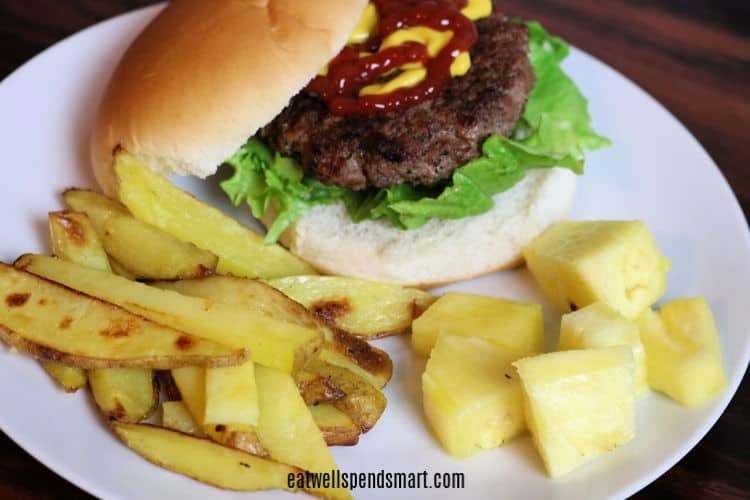 Burgers to the rescue with ground beef from the freezer put away last week. My husband’s sister and nephew came to spend the night, and we were unclear about what dinner would entail. 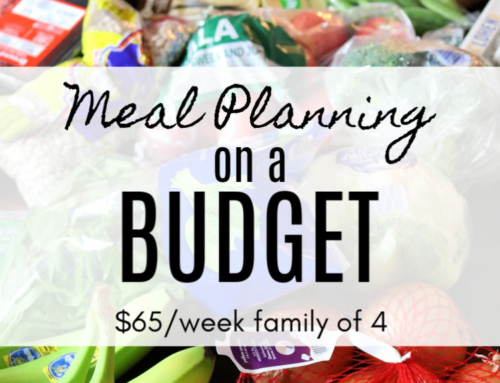 I figured we might eat out and dip into our eating out budget line items. Instead, we decided to stay in and have a wild game night of “Ticket to Ride” and snacks. We bought tortilla chips, salsa, avocados for guac, a box of toasted ravioli, and strawberries. It was an extra $18 for what we ate that night. I also popped some popcorn and served other fruit. We had our main meal for lunch, which I don’t have pictured but will explain. Our food pantry at church received meat from Longhorn. We had cases and cases of small boneless pork chops, and the husband and wife that run our food pantry gave us a couple of four-packs. I cooked pork chops and the last of the frozen green beans quickly on the stove top and served it with apples and pineapple. Saturday night we ate at my brother-in-law’s house. Yay for a night off of cooking! Looking back on this week, I can tell I was battling a week-long headache. I don’t know if it’s the change of season, all the rain we have had, or something else entirely, but my head hasn’t been kind to me. 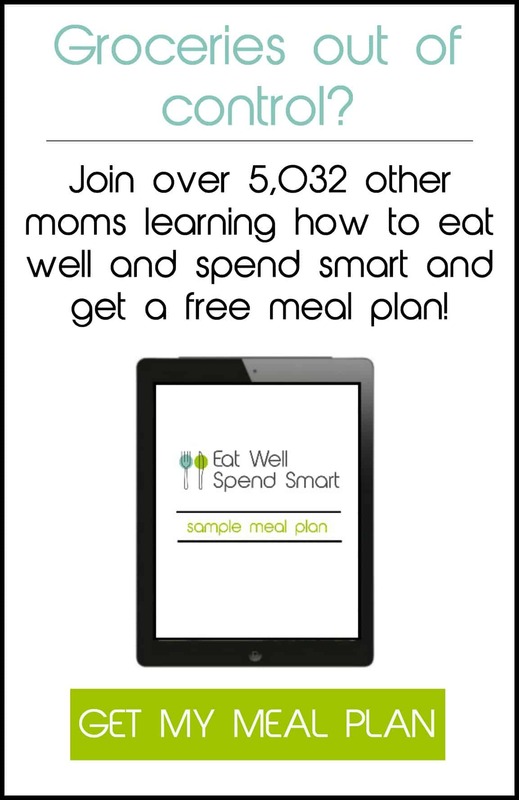 I put very little energy into our meals this week and purposely kept it very simple. That’s ok though because the most important thing is that my family was fed. 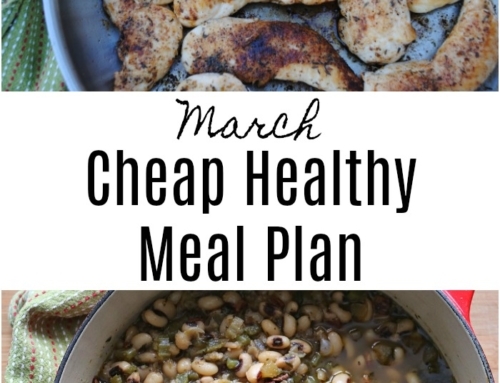 This is the last week that I will be documenting what we ate on our $60 grocery budget challenge for the month of March. I have to say, I’m happy that it’s over. While I learned some very valuable lessons and will be sharing them soon, it will be nice to add back in an extra $20 to give us some conveniences like a few more snacks. What I bought this week with a budget of $30. I went over because the trip to Sam’s Club was a complete surprise. I didn’t buy meat because I have plenty in the freezer. I am enjoying this very much! I look forward to the week to see how it turns out. I enjoyed seeing how you challenged yourself. It was also nice to see a family just being real. Not every family meal is gourmet! 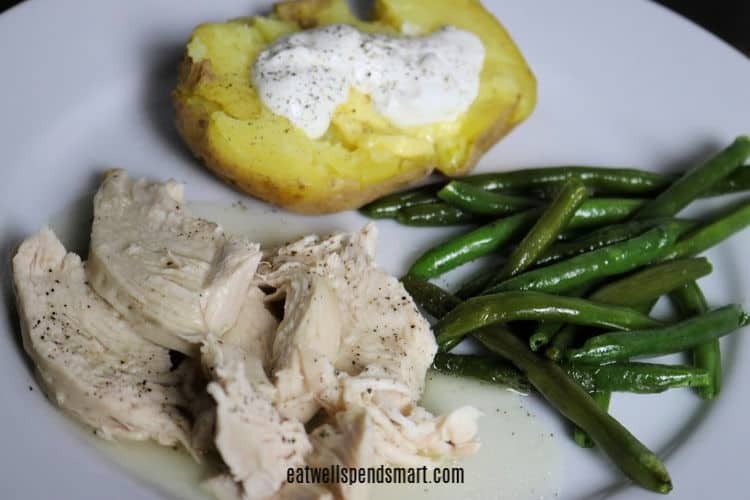 The chicken/potato/greenbean dinner is a staple here and we use the chicken completely. I rarely season my bone broth (which I do in a crockpot overnight after dinner and picking all the meat off the bones for stir fry or chicken salad), because I don’t know what it will go into later. 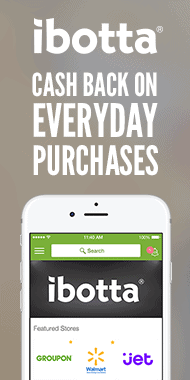 I thought I might mention that Kroger stores (and related chains?) are now offering a price gun to carry around the store that adds up your purchases for ease of checkout. I haven’t tried it, but it seems like it may be useful for tight budget shopping. I just shopped for my second week. Our choices are Walmart and Safeway. Keeping at $30 is hard but an enjoyable challenge. We ran out of milk last week which was a real bummer but otherwise we did ok. Normally I would go to the store 2 or 3 times during the week but I like the time it saves just going once. There is still meat and veggies left in the freezer and other fridge and pantry goods to draw from. 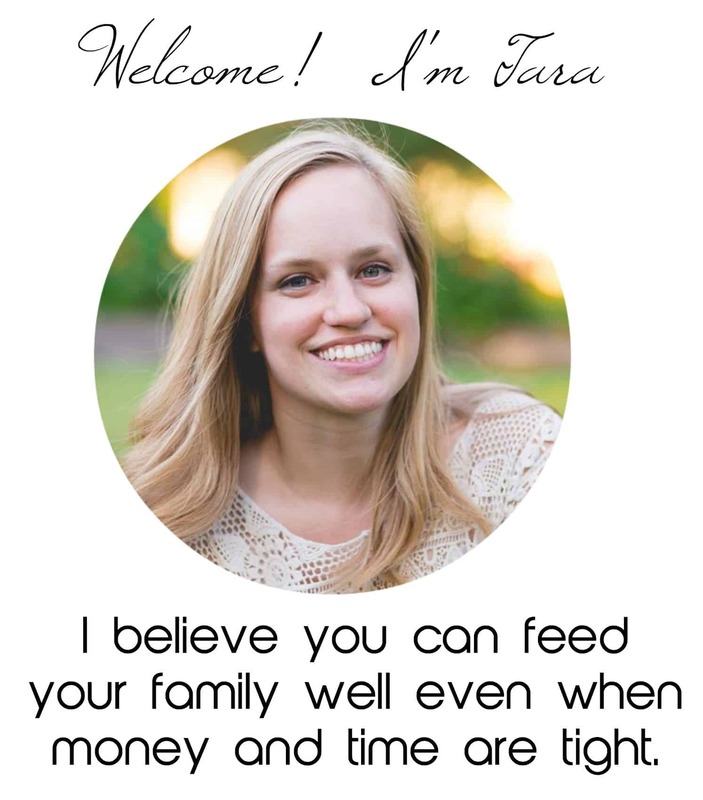 Thanks, Tara, for the inspiration!